With 2014 rapidly approaching, the midpoint of the NBA season is almost upon us, and the standings in each conference is slowly becoming clearer. Some teams are already focusing on the blockbuster 2014 draft class, while others are charging towards deep playoff runs and hopeful title tilts. Continue reading for the comprehensive ranking of each conference as we call it wraps on the 2013 NBA year. The Jazz have one of the most promising young cores in the league in Trey Burke, Alec Burks, Gordan Haywood, Derrick Favors and Enes Kanter. But what they have in potential, they are drastically lacking in experience. Burke missed the first 12 games of the season – a stretch where the Jazz went 1-11 – and Kanter’s game has failed to develop as well as many hoped it would. And as long as Richard Jefferson and Marvin Williams are playing significant minutes, the Jazz don’t seem likely to clime out of the basement in the West. Haywood has proven he can be a player in the league, bumping his averages to 16-5-5, but the rest of the season will see the Utah faithful praying the basketball Gods bless them with Andrew Wiggins or Jabari Parker next year. The Kings came into the season reinvigorated under new ownership and the promise that the team would not be relocating to Seattle. But as most new owners are prone to do, the wait for his team to improve became too much for Vivek Ranadive and he promptly traded for one of the league’s worst contracts and brought in gunslinger Rudy Gay. The trio of DeMarcus Cousins, Gay and Isaiah Thomas has proved to be exciting to watch, but the Kings still remain the second worst defensive team in the league, giving up 103.6 points per game. Derrick Williams has shown flashes that he could be a valuable player – even if he will probably never live up to his second overall draft position – but has once again found himself in an unusual minutes share in SacTown. Until Sacramento – in particular Gay and Cousins – begin to start playing something resembling defence, and the front office can work a deal to find better position balance on the roster, the Kings are lottery bound. Kobe Bryant has only played six games this season. 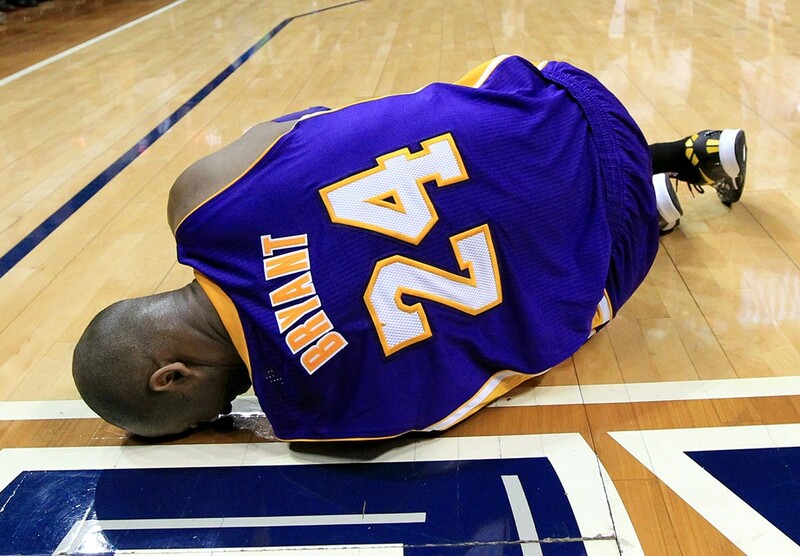 That pretty much sums up the Lakers season. Bryant missed the first 19 games of the season after having surgery on his Achilles tendon in April and only managed six games – where the Lakers went 2-4 – before suffering a fracture in his left knee which will see him miss another six weeks of action. Meanwhile, point guards Steve Blake (elbow) and Steve Nash (back) will also be out for extended periods, leaving LA with only Jordan Farmar and Kendall Marshall as the only true point guards on the roster. Xavier Henry (10.4 ppg) and Nick Young (15.9) have battle valiantly to fill the gigantic void left by Bryant, but with Pau Gasol having a subpar season – 15-9-3 – and LA sitting 28th in the league for points allowed per game, it will be a gargantuan even for the Black Mamba to drag the Lakers into the playoffs this season. Another team hampered by injuries, the Grizzlies have been struggling since their defensive anchor Marc Gasol tore his MCL in November. Memphis’ defence has still been solid – only allowing a sixth best 97.3 points per game – but are 25th in the league in scoring and have struggled to find a consistent perimeter scorer all season. The Grizzlies are dead last in the league for three pointers made, and Mike Miller is the only player on the roster shooting better than 40% from behind the arc. But Memphis’ offence has never been pretty. You don’t earn the moniker “Grit n Grind Grizz” because you pour in buckets night after night. If they can return to shutting out teams once Gasol returns, a playoff berth is not farfetched, but someone needs to start putting the ball in the hole. The Pelicans were one of the hardest teams to forecast before the season began. 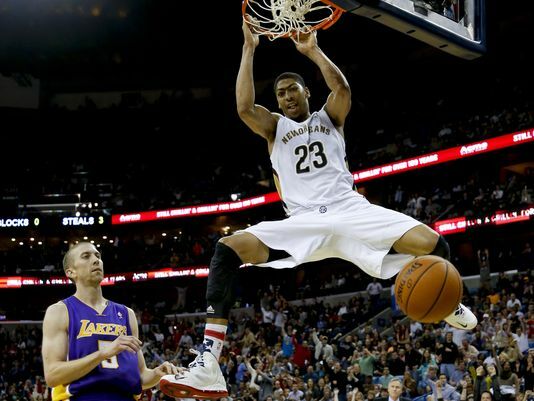 How good would Anthony Davis be? How would the backcourt trio of Jrue Holiday, Tyreke Evans and Eric Gordon function? Could anyone other than Davis play defence? Would they trade Ryan Anderson? Davis is destined to be a top-5 player in the league and perennial MVP candidate. The second-year forward is averaging a respectable 19.4 points and 10.4 rebounds per game, but his defence has been incredible, putting up 3.1 blocks and 1.5 steals a contest. Couple that with an improving outside shot and guard-like handles and NOLA has a superstar on their hands. The backcourt trio is still a work in progress. Holiday has dropped off from his All-Star play last season, Gordon has managed to stay healthy, but is not the same player he was in his time as a Clipper, and Evans has been up and down all season as he adjusts to playing the three and struggled to find his outside shot (15.6% from deep) and slashing lanes without the ball in his hands. They remain 25th in the league for points against, but Jason Smith has been a solid rim protector alongside Davis, averaging 1.1 blocks a night. Before the season, social media’s favourite trade was Anderson for Omer Asik. 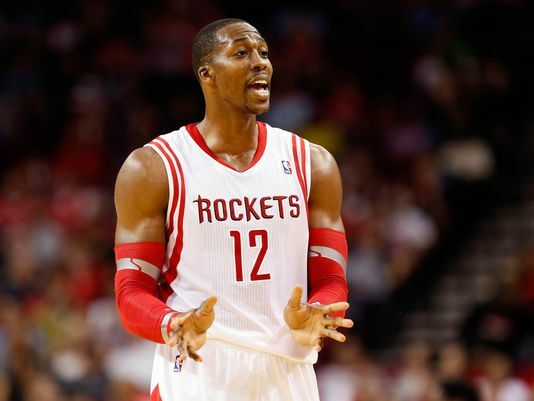 It provided Houston with a stretch four to pair with Dwight Howard, and New Orleans with a defensive stopper to pair with Davis. However, Asik has failed to impress this season, and Anderson has been fantastic. The sharpshooting big man is leading the Pelicans in scoring since his return to the court, averaging 20.3 points per night and is hitting 3.3 threes a night at a 42.6% clip. Looks like he’s a keeper. Overall, New Orleans is an exciting team led by an exciting star, but the roster needs a few more adjustments before they can become a postseason player. Last season, the Nuggets were the “superstar team without a superstar”, as they rolled other teams at home and played solid defence and scored by committee. However, in the offseason, they lost their closest resemblance to a superstar in Andre Iguodala, and things haven’t faired as well this season. It is hard to definitively declare the Nuggets a good or bad team. They are middle of the pack in both offensive and defensive rating. They have five players averaging double-digit points – rounding up Kenneth Faried’s 9.5. But they just aren’t the team they were a year ago – last season they lost only three games at home for the entire season, this year through 13 home games they have lost six. The absence of Danilo Gallinari and JaVale McGee has hurt them on both ends of the floor, and the combination of JJ Hickson and Faried is one of the worst defensive frontcourts in the league. Ty Lawson is trying his best to keep things afloat, averaging career highs in points and assists, but he is going to need some help if the Nuggets are any chance of making the playoffs. 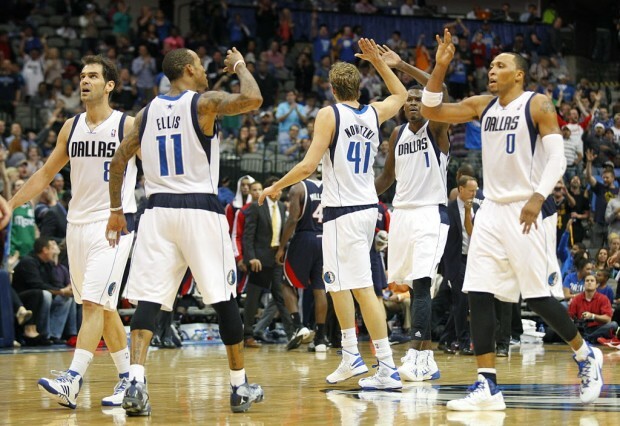 The Dirk Nowitzki–Monta Ellis duo has been one of the more interesting subplots of the season so far. Ellis has reinvigorated his game alongside the gangly German, while Nowitzki continues to play like Nowitzki. Playing alongside a pass-first, spot up-shooting point guard in Jose Calderon has finally freed Ellis to slash and get the ball in good positions to score. The Ellis/Nowitzki combo is a big reason why the Mavericks are the leagues seventh best offensive team – as well as solid contributions from Vince Carter, Calderon, Shawn Marion and Brandon Wright – but they are equally responsible for their subpar defence. Nowitzki has never been a great defender, and has been most effective with a rim protector playing behind him – likewise, Ellis and Calderon have a penchant for playing matador defence – and with Samuel Dalembert struggling to stay on the floor, it has been open season for opponents trying to score at the rim. The Mavs are entrenched in the playoffs race, but their struggles on the defensive end could be their undoing. Yet another team with an incredible ability to score but inability to prevent their opponents from doing the same, the Timberwolves are one of the leagues best scorers (second in the league) and worst defensive teams (24th). Kevin Love is having a MVP calibre season, putting up 26.1 points, 13.8 rebounds and 4.2 assists with 2.5 threes at 38.6% and 46.4% from the field. Likewise, Kevin Martin has found his groove again, hitting 19.9 points per game at 41.7%, and Nikola Pekovic is leading the league in lay-ups per game. But the defensive pairing of Love and Pekovic is a smorgasbord for opposing teams, averaging a combined 0.7 blocks per game. Corey Brewer is the team’s best defender, but his gambling for breakaway steals and leak out buckets does as much damage as his lockdown defence at times. Ricky Rubio continues to struggle from the floor, shooting an abysmal 34.5% from the floor, and has seen his scoring drop to 8.9 points per game. The Timberwolves are a great team to watch, but their lack of defence is drastically hurting their chances of making a playoff run, and their chances of re-signing Love at the end of his current deal after lowballing him with a four-year extension and making zero playoff appearances since he joined the league. The Suns are one of the most surprising teams in the league. After many predicted them to occupy the cellar of the West and struggle to notch 20 wins for the season, Phoenix is sitting in the thick of the playoffs race. 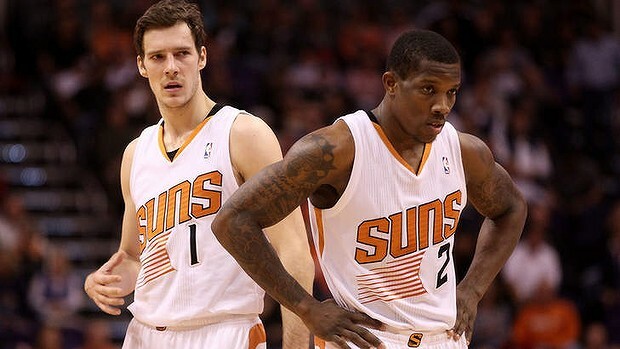 Eric Bledsoe has proven to be a steal after coming to Arizona via trade in the offseason. 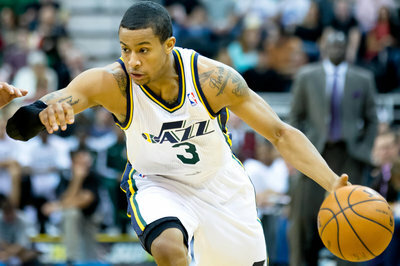 The burly guard is averaging a team high 18.4 points per game to go along with 5.9 assists, 4.3 rebounds and 1.5 steals. Bledsoe’s backcourt running mate, Goran Dragic, has also been fantastic for the Suns (18-6-3), as Phoenix’s two-headed point guard attack orchestrates a barrage of threes (sixth in the league for made and attempted) and pushing the ninth fastest pace in the league. So far, Jeff Horncek’s men look all the part of a playoff team, they have the aforementioned guards running the show, fellow breakout player Miles Plumlee protecting the rim (1.8 blocks per), and a solid core of sharpshooters bombing away from downtown. But just like the Knicks last season, all it takes is the Suns’ outside shooting to cool down and they could rocket down the standings just as quickly as their climbed them. The Warriors have proven they can be a force to reckon with when everybody is healthy, knocking of several contenders, but Steph Curry and Andre Iguodala have already missed chunks of games and with Jermaine O’Neal and Festus Ezili they are weak on the frontline. Curry has continued his ascension into the top tier of point guards in the league. His shooting is unparalleled and his passing and court vision has improved dramatically this season, now averaging a career high 9.5 assists per game. Klay Thompson has become a consistent second scoring option, while David Lee remains a nightly double-double threat, and Andrew Bogut is the defensive anchor that Golden State fans have been dreaming of since Baron Davis and co. were leading the charge in Oakland. The biggest improvement for the Dubs this season has come on the defensive end. Andre Iguodala has blossomed as the teams utility, capable of running the point with the second unit, and preventing Curry from getting burnt by pretty much any point guard he faces. However, it still feels like Golden State are one injury away from it all falling apart. Their bench isn’t as solid as it was last season, and if one key piece is forced to miss an extended period of time, it could all go pear-shaped in the North Cali. It has taken almost half the season, but the Rockets seem to have finally found their groove and are cruising to a potential home court advantage in the playoffs. James Harden has continued his stellar play from last season, putting up 24 points, 5.5 assists and 4.7 rebounds a night, while Dwight Howard finally seems comfortable on the basketball court again, averaging 20.1 points, 14.6 rebounds and 1.6 blocks per game through December. Chandler Parsons (17.4 points) and Jeremy Lin (14.5) remain solid contributors, and Terrence Jones has filled the disappointing void left by Omer Asik’s terrible season. However, Houston are still one piece away from being true title contenders. Another perimeter defender would help their cause, and they can never have enough outside shooters to put around Howard. However, Asik still holds some value around the league and it is likely that they will find a trade partner before the deadline. Anyone that says they saw Portland’s emergence as a powerhouse in the West is lying to your face. They entered the season as an improved team who critics were sceptical of their playoff hopes, and now everyone has egg on their faces. LaMarcus Aldridge (23.4 points, 10.9 rebounds, 47.2% shooting) and Damian Lillard (21.1 points, 5.8 assists, 3.1 threes per) are playing out of their skin and have the Trailblazers off to a franchise record start. Last season, the Blazers’ bench was their Achilles heel. This season, the additions of Mo Williams, Dorell Wright and Robin Lopez have helped stop the wheels from falling off when Lillard and Aldridge take a deserved breather. However, Portland is still top heavy and requires their starters to do the majority share of pretty much everything. Thomas Robinson and Myers Leonard are still developing young bigs, while CJ McCollum is yet to step foot on an NBA court. The Blazers are also a terrible defensive team, ranking 22nd in the league in defensive efficiency. They are first in the league in scoring, but as soon as that cools off, Portland are at risk of sliding down the rankings. The Clippers are great, but there are still several issues they need to address before they can consider themselves sure-fire title hopefuls. Chris Paul is playing some of the most inspired basketball of his career (19.9 points, 11.4 assists, 2.5 steals and 46.4% from the floor) and Blake Griffin is proving he is more than a high flyer this season (21.9 points, 10.6 rebounds, 3.1 assists and an improved 70% from the line). Jamal Crawford is still one of the leagues premier bench scorers (16.8 points per) and JJ Redick (15.8 points and 1.9 threes per) was working a fantastic partnership with Paul, coming off screens and hitting jump shots, before breaking his right hand and tearing a ligament in his right elbow. 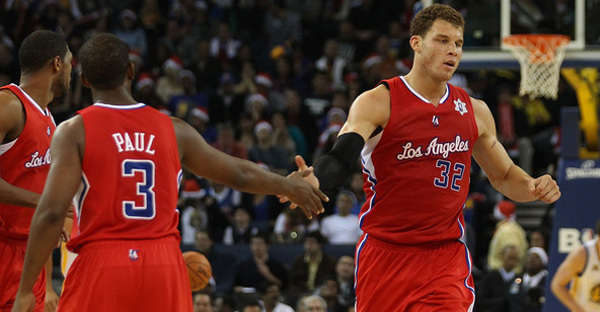 The Clippers’ biggest downfall comes in their big man rotation. Griffin and DeAndre Jordan show flashes of brilliance together, but Jordan is prone to foul trouble and brain lapses on defence. Griffin has improved his free throw shooting, but Jordan still remains a Dwight Howard-esque liability in crunch time. LA needs a third big to add to the rotation. Byron Mullen, Ryan Hollins and Antawn Jamison are just not the answer. The fate of Emeka Okafor could drastically alter the Clippers title hopes. If Phoenix decides that don’t need/want Okafor for a playoff push, he will most likely be bought out by the Suns, and could fit right into Doc Rivers defensive system. At the moment, the Clippers are almost there, but not quite at the level of the next two teams. What is there to say about the Spurs? It is just another case of: another season, another first class display of how to play basketball for Gregg Popovich’s troops. Tim Duncan is somehow still playing at ridiculously elite level, continuing to put up great numbers at a super efficient rate (14.1 points, 9.5 rebounds, two blocks, 44.9% shooting, all in only 28 minutes a night!). Tony Parker is still Tony Parker: fast, efficient, and underrated. And Manu Ginobili is making his case of Sixth Man of the Year honors. Oh, and Marco Belinelli is shooting 49% from deep, rendering the loss of Gary Neal completely irrelevant. There isn’t much left to say about the Spurs. They play great defence (third most efficient), they play great offence (ninth), their role players embrace Popovich’s system and fill their roles perfectly, Duncan refuses to slow down, Parker continues to be the least herald superstar in the game. Check back with the Spurs once the real season begins in June. 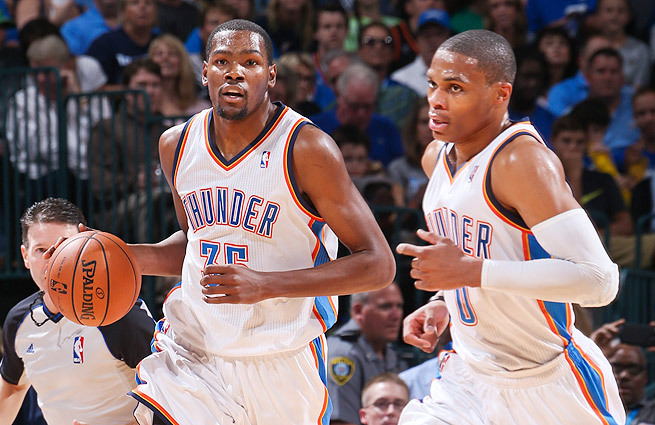 Kevin Durant is sick of being second, and he gets his wish in the Western Conference at least. No one in the West is close to Durant’s level at the moment. KD leads the league in scoring at 28.3 per, while also grabbing 8.1 boards, dishing 4.8 dimes and closing in on another 40-50-90 season at 42-49-88 through 29 games. But while most people focus on Durant’s incredible individual performance this season, the Thunder are quietly one of the leagues best defensive teams (second in efficiency and eights in points allowed). Serge Ibaka remains one of the leagues premier rim protectors at 2.3 blocks a night, Reggie Jackson has filled in valiantly in Russell Westbrook’s absence (12.4 points and 3.4 assists), and Steven Adams, Jeremy Lamb and Nick Collision are fantastic role players. If OKC can somehow manage to offload Kendrick Perkins $8.4 million and bring in another rim protector – think Omer Asik – or perimeter scorer – think Arron Afflalo – they may as well stamp their tickets to the finals now.